car was a bright-red 6-speed manual coupe with the Brembo brakes. The salesman was a young guy, probably in his mid-twenties, and he came along for the ride. (it was a Saturday) and proceeded to do a couple of donuts in a parking lot. We were approaching a 3-way T-intersection when he decided to floor it. automobile (a lowly base-model VW Golf), but the salesmen didn’t let up. window of the store on the far side of the intersection. Just after I had tightened my seat belt, the salesman slammed on the brakes. was suspended in my seatbelt. We came to a rest at least 10 feet before the stop sign. It didn’t matter how much they cost, I just had to have those brakes! a “race car”, but that’s not what they really want. have any sound proofing, or any rubber in the suspension, or air conditioning. cater to dreamers like me who thought that they wanted a race car, at least on paper. were mounted Michelin Pilot Sport tires with a sidewall aspect ratio of 45.
summer-only tire, and is close to being rated an R-compound racing tire. 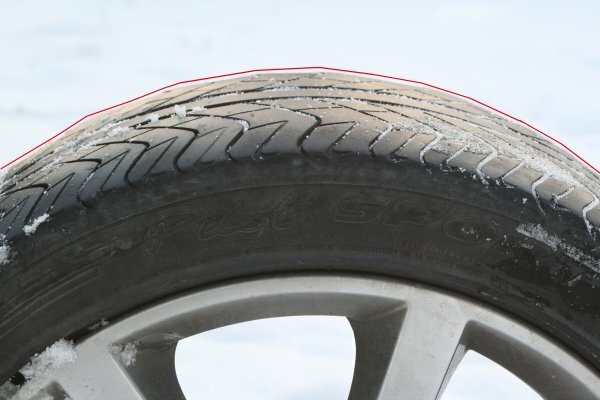 tires – particularly the rear tires – do not sit flat on the ground. They have a small camber angle to them, resulting in a duck-like stance. When the car goes around a corner, it rolls to the outside of the turn. tire to sit flat in the middle of a corner, giving it better cornering grip. where I’m travelling in a straight line. This causes the tires to wear unevenly. it tends to wear much faster than the outside portion. tread is more worn than the outside. a “tricontagon” (a 30 sided shape). think that my cell phone is vibrating in my pocket and I attempt to answer the call! for hundreds of hours of year in these conditions. can perform in his own driveway. 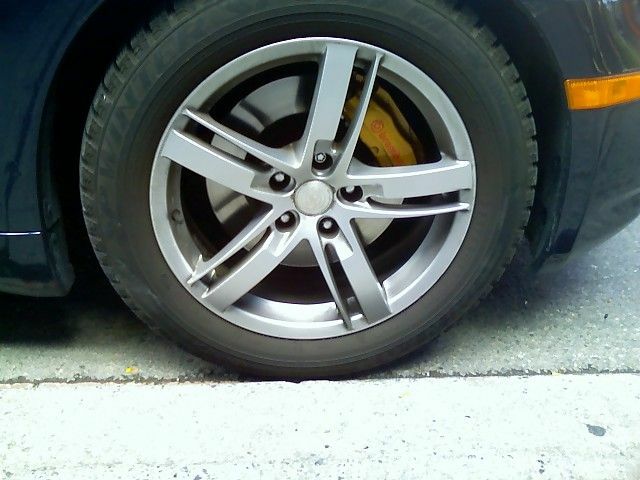 A slightly over-inflated tire is much safer than a slightly under-inflated tire. in the car, or on a rainy day. around corners, the tires would wear more evenly and might even last longer. rear tires and I’m about to put new tires on the front of the car. over 100,000 km out of the first set of tires. when I turned onto my side street there was still a thin sprinkling of snow. get the car moving in first gear, even with the traction control turned off. I left the car on the side of the road and walked the rest of the way home. Normally, when you purchase snow tires and new rims, you’ll go down one rim size. but I do remember being shocked that it was going to be many thousands of dollars. pulleys, and a limited slip differential. 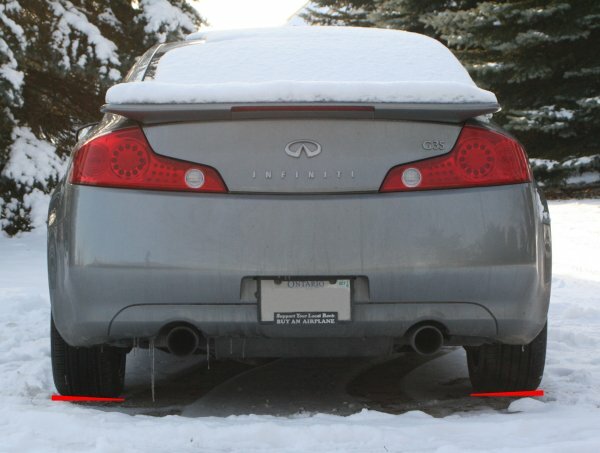 Infiniti for at least one winter. in a shortage of winter tires for the rest of the Canada. 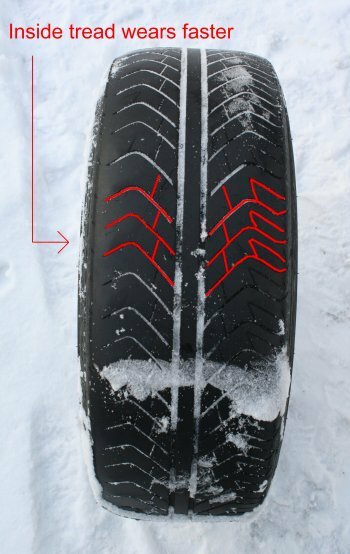 quick online research and I had been looking at the exact same tires. assume that this is a special low-volume application. Sports they replace. I’ll give you a full report soon. them, and not to look like a playa’. I now have 40,000 km (25,000 miles) of use on the Michelin Pilot HX MXM4 tires. are still smooth and quiet with no visible feathering. Do they have as much peak cornering and braking grip as the OEM Michelin Pilot Sport tires? No. Are they fantastic snow and ice tires? No. fit my “mission profile” perfectly. the middle of the summer, so I’m not sure why the owner was driving around with snow tires!). A friend snapped the photo below with his iPhone. After some investigation, I discovered that these are BSA 264 17″ rims, which were reportedly sold at many Canadian Infiniti dealers.